Both Laura and I are participating in Patti Digh’s Project 137, again this year. I started last year and about a month into the 137 days-long project, promptly broke my “write” hand; that sort of put a damper on a lot of my written activities for about two months as I was in a cast and a brace. This year, all’s well and fingers crossed that I don’t sustain another accident, I intend to carry on. Last week, Laura shared her take on one of our daily activities: at the end of the day, we say a blessing and perform the ritual of moving a treasure from one container to another. Wanting to jumpstart my art journaling, I decided I’d make a heart each day; so, on the first day, I stamped hearts onto an art journal page and wrote a bit about my hopes. 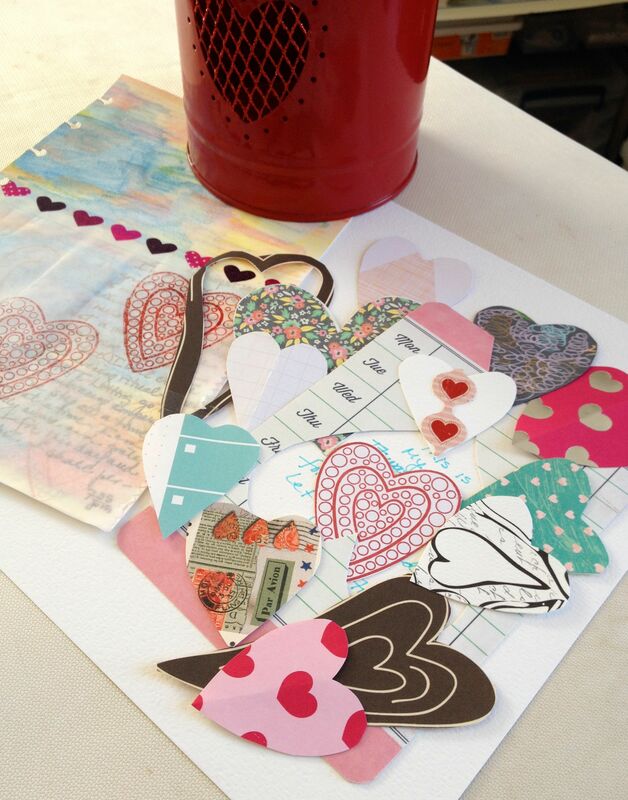 A few days elapsed and then I had a brainstorm: I decided to make a different heart each day and put it in a special red bucket I have that also has a heart motif on it. On one side of the paper heart, I write the date. I also write journal entries that explore each heart in more depth. In the past few days, Patti has encouraged us to choose one word that summarizes [the emotion of] that day and to add it to our container. That’s a challenge, to say the least. My intent is to eventually include all my hearts into some form of a piece of artwork that I’ll display on the wall. I think that should be fun. Stay tuned; ‘t’will be continued..
29 Aug	This entry was written by Honoré and published on August 29, 2014 at 4:16 pm. It’s filed under Authenticity, Commitment, Creativity, Honoré, Self Care. Bookmark the permalink. Follow any comments here with the RSS feed for this post. I totally get the “slow summer” part now, Laura…combining this much (fabulous) activity into one’s life…plus work. Whew! Honore…this effort is so you, my dear. So you. And, I just keep adding my OLWs around one another…they occasionally shift position, of course.